The S.P.A.S. is an integrated self-defense system based on the Personal Safety Concept. 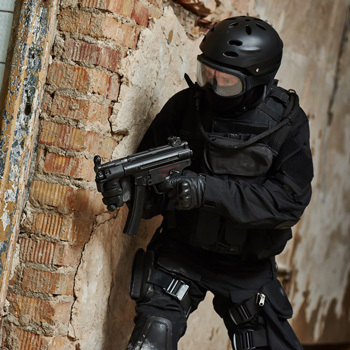 It is one of the most effective combat systems designed to address issues of human response to extreme situations. It’s aimed at teaching everyone how to survive in any extreme situation. S.P.A.S. 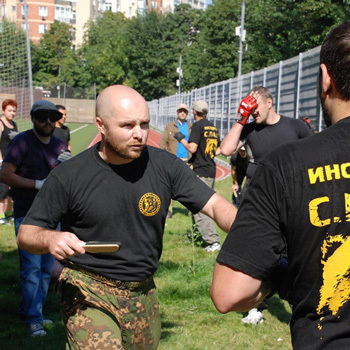 training helps to achieve the main goal of self-defense – making the aggressor abandon his intention, by teaching appropriate tactics and movement patterns. Tactics schemes are divided into 3 segments: escape, withdrawal, suppression. The use of every scheme depends on our assesment of the threatening situation. S.P.A.S. 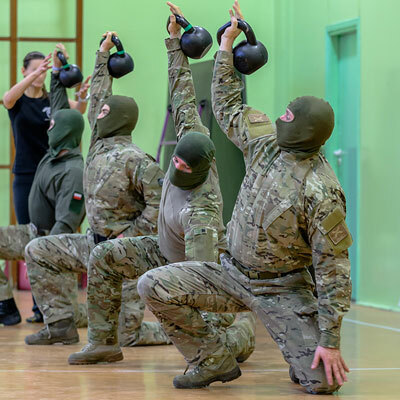 embraces all aspects of combat and self-defense including hand-to-hand combat, ground fighting, knife fighting, use of different handheld weapons, shooting and physical conditioning programs. S.P.A.S. is a combat system designed to address issues of human response to extreme situations. It’s aimed at teaching everyone how to survive in any extreme situation. S.P.A.S. training helps to achieve the main goal of self-defense – making the aggressor abandon his intention, by teaching appropriate tactics and movement patterns. Tactics schemes are divided into 3 segments: escape, withdrawal, suppression. The use of every scheme depends on our assessment of the threatening situation. Available attack zones, defense against gripping, basics of striking, control of personal space. An extended arsenal of kicks and strikes, nonstandard and shocking hits. Working with self-defense schemes. Combination of punches and kicks in one dynamic, training of attacking and counter-attack schemes. Opponent deception schemes. С5 – Hand-to-hand combat in S.P.A.S. Active sectoral defense, patterns of violent transition to the counterattack, nonstandard striking schemes. С6 – Basics of close range combat in S.P.A.S. Interrupting opponents strikes, opponent control in stance. С7 – Melee in S.P.A.S. Hitting in close range, safe kicking, methods of interrupting opponents attacks, advanced opponent control in stance. Basic attack techniques (cutting, pushing, chopping) and counterattacks. The basics of fighting tactics, working at different distances. Sectors and areas of attack. Complete technical arsenal of attacks and defense, work with distance, depth and attack levels combining several attacking techniques into sequences. Tactics of fighting, leading off successful attacks and counterattacks. Knife clinching, methods of clinch initiations, off-hand striking and kicking in knife fighting, working with any knife surface, scheme of merging strokes, cuts and thrusts. Techniques for using kubotan in self-defense, including defense against punches and kicks, defense against gripping and overthrows. Schemes of attack and counterattack, combining kubotan work with off-hand and kicks. Use of kubotan on the ground. 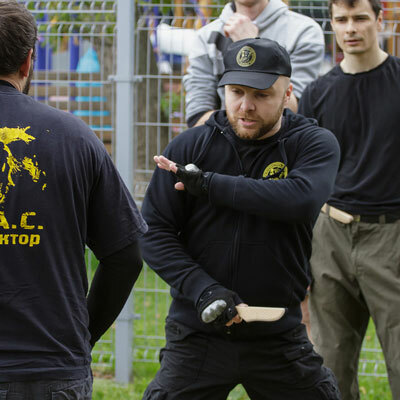 Knife defense in street fighting situations. Defend against kicks and punches, fight against a group of people, defend against blackmails with knives. Techniques to pull out the knife during the fight, schemes of work against the unarmed opponents, defense against knife attack, counteracting knife extraction out by the opponent. Fundamentals of working on the ground. Acquiring comfortable position, escape from fighting on the ground. Basic chokes and levers, enemy control - a practical street arsenal. Extended techniques arsenal. Rapid switches between techniques. Defense methods, advanced grappling techniques. The S.P.A.S. system contains also special tactical and techincal programs dedicated to security service units such as the military or the police.